Next, the torch-bearers started their run. 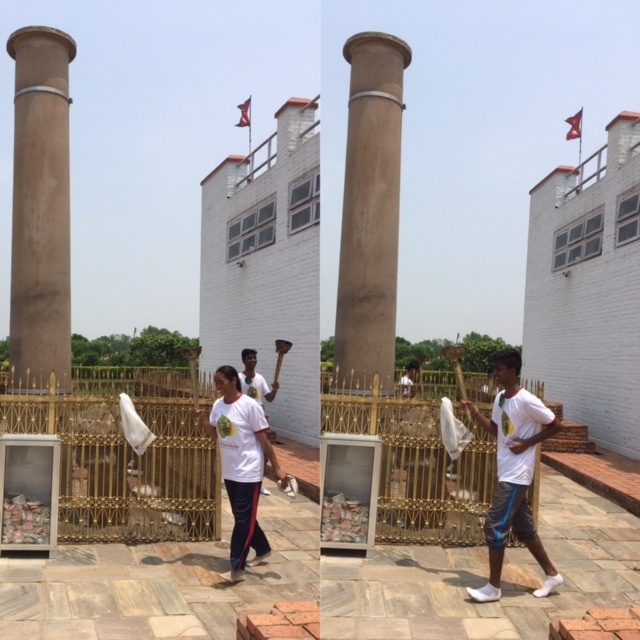 They ran around Maya Devi Temple, Lumbini, that is Lord Buddha's birth site. The team also did a parikrama of the lake and the Ashokan Pillar in the same premises. 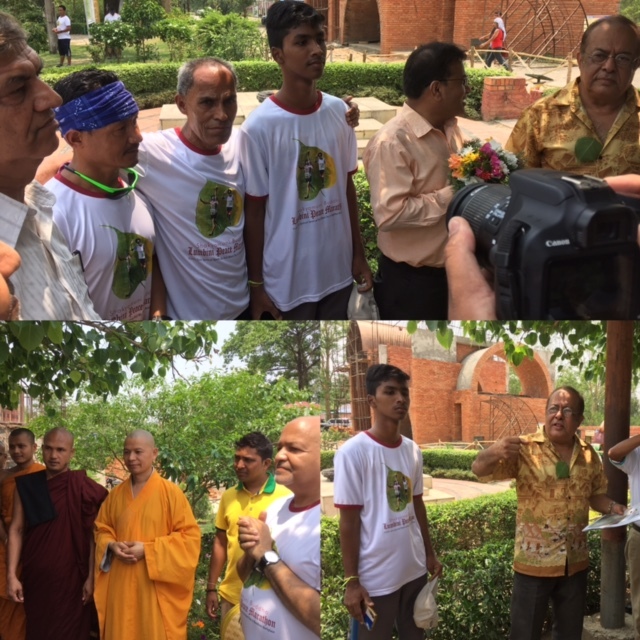 The next peace run stop was Kudan (Nygirodharma), the place where Siddhartha Gautama stayed after returning home as Enlightened Buddha. The team did the round of the existing remains of the structure. Budhia, along with the team, also circumambulated (parikrama) the Ashokan Pillar at Gotihawa, the birth and Nirvana place of Krakuchanda Muni Buddha. 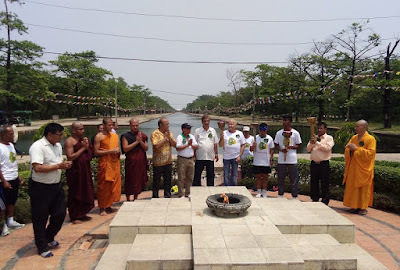 The team continued the run to ancient Kapilvastu, a UNESCO World heritage site, and then circumambulated (parikrama) the Tilaurakot Palace structure site. 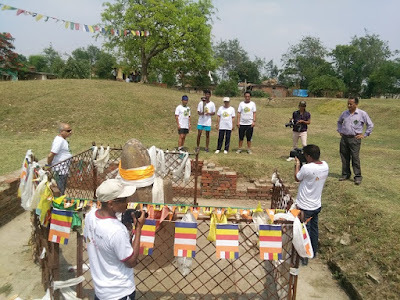 Next, we went to the Buddha Ganga River (also known as Ban Ganga) where the team took the blessings of the river and splashed the holy water to spiritualize themselves. 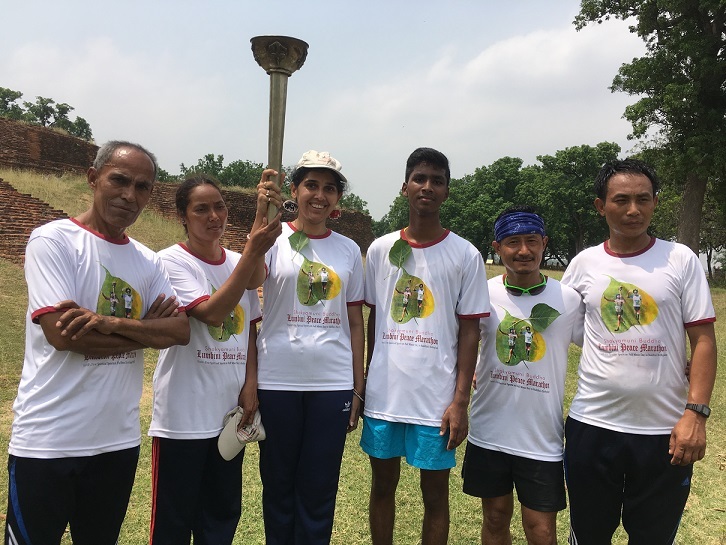 The team ran on the Maya Devi Maternity Route that was the same path that Buddha's Mother Maya Devi took on her return journey to Kapilvastu palace after giving birth to Gautam Buddha. Next, we reached the Niglihawa Ashokan Pillar Site. Emperor Ashoka had erected this Pillar to symbolize the birth place of Kanakmuni Buddha. 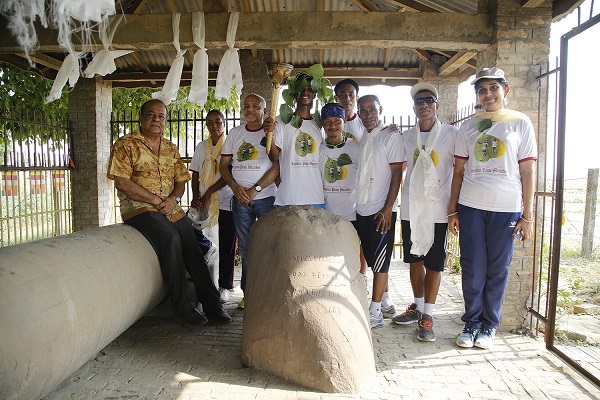 Budhia did a parikrama of the Ashokan pillar along with the team. 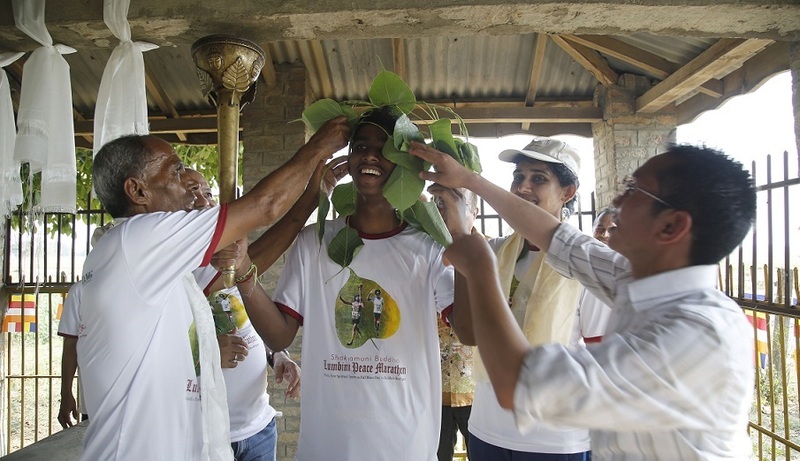 Budhia was honored with a Bodhi leaves crown by Baikuntha Manandhar, Prof Dr.Panth, and Deepak Rai. 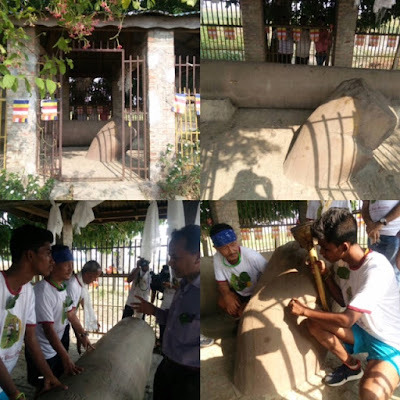 Though Aurorakot, the natal town of Kanak Muni Buddha, was to be touched as per the initial programme, the run stopped at Niglihawa. 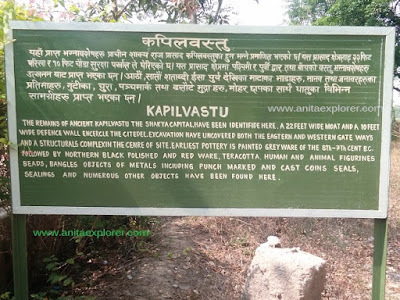 "Kalinga and Kapilvastu Lumbini got connected in the footsteps & spirit of Kalinga’s Emperor Ashoka. Apart from highlighting the spiritual connection between two sister-cities, Budhia Singh running with the Peace Torch with Buddha Flame, also symbolizes "Spiritual Sports". Budhia plays a key role in Kalinga–Kapilvastu connection," Bikram Pandey KAJI, the chief organiser observed. 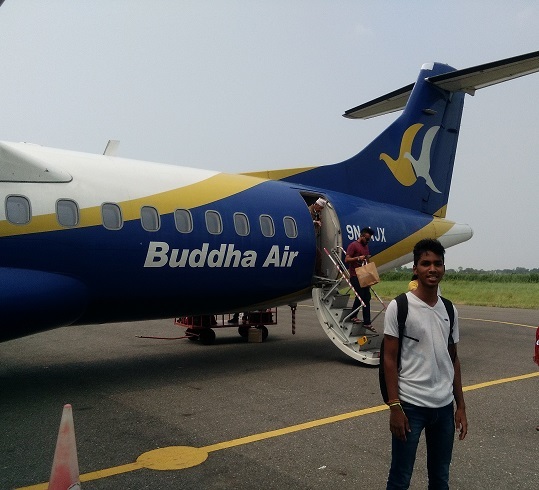 To board our return flight to Kathmandu, we travelled back from Lumbini to Bhairahawa. Despite getting the Boarding Pass & having waited for 3 hours, everyone was disappointed to learn that the Buddha Air flight had been cancelled. It was raining heavily at Kathmandu. The next flight to Kathmandu would start only the next morning. 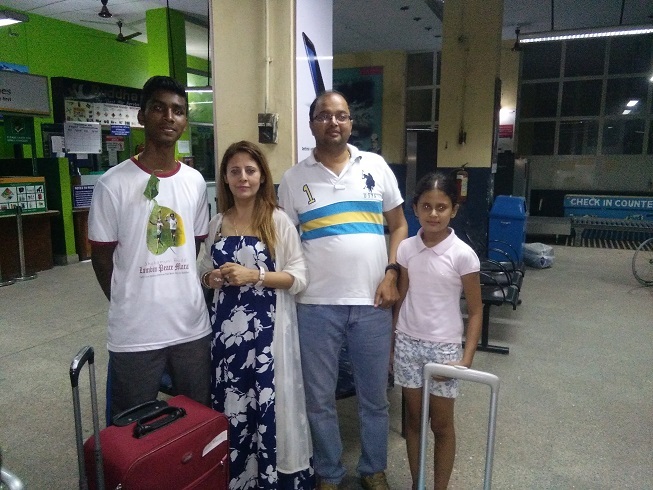 Then, as we started talking to the other passengers, Budhia's fans started clicking pics with him! As the flight from Lumbini to Kathmandu was cancelled, we had to cancel our hotel-booking at Kathmandu and had to settle for an unplanned night halt at Bhirahawa. After checking into Hotel NANSC, we had our dinner at the next-door restaurant named CANNS. Our phone batteries had run out of charge and all the running around had drained our batteries too. We tried sharing some videos before sleep took over us. We had our flight to Kathmandu the next morning. ABC Wednesday- S for Sites & S for Singh. This post has info about the Buddhist Heritage Sites in Nepal where Budhia Singh & Team (including me) travelled for the Buddha Flame Peace Torch March Run 2017. Thanks to Tenzing Hillary Everest Marathon, Department of Tourism, Government of Nepal. "Budhia Singh At Nepal - Day 3"
I saw the movie on Bhudia Singh recently, and was really touched by it. What a waste of talent in India by not having him participate in olympics! Glad to see you being with him.